The arrest of a top executive of Chinese telecommunications firm Huawei Technologies, at the request of the US, sparked fresh worries about the US-China relations and dampened investors' appetite for riskier assets on Thursday. The global flight to safety underpinned the US Dollar's relative safe-haven status and exerted some initial downward pressure on the EUR/USD pair. The buck failed to capitalize on the early uptick and was further weighed down by the disappointing release of US private sector employment report, showing that the private sector employers added 179K new jobs in November as against 195K expected. Meanwhile, the USD bulls seemed rather unaffected by upbeat US ISM non-manufacturing PMI, which unexpectedly rose to 60.7 in November from 60.3 previous. Adding to this, an inversion in part of the US Treasury bond yield curve, which is seen as an early warning sign for a potential recession, further pressured the greenback and provided an additional boost to the pair's intraday positive momentum. The pair jumped back above the 1.1400 handle, albeit the up-move seemed to fizzle out ahead of weekly tops set on Tuesday. The pair now seems to have stabilized and was seen oscillating in a narrow trading band through the Asian session on Friday. Market participants now look forward to the closely watched US monthly jobs report, popularly known as NFP, for some meaningful impetus on the last trading day of the week. Despite today's key macro data, investors will still have reasons to be cautious ahead of the latest FOMC monetary policy decision, later in the month. Hence, any immediate reaction to the data might be limited and the pair might continue with its lacklustre/range-bound price action within a broader trading range. From a technical perspective, the pair on Thursday started losing steam from a short-term descending trend-line resistance, extending from highs set on Oct. 22, Nov. 7-19-20. 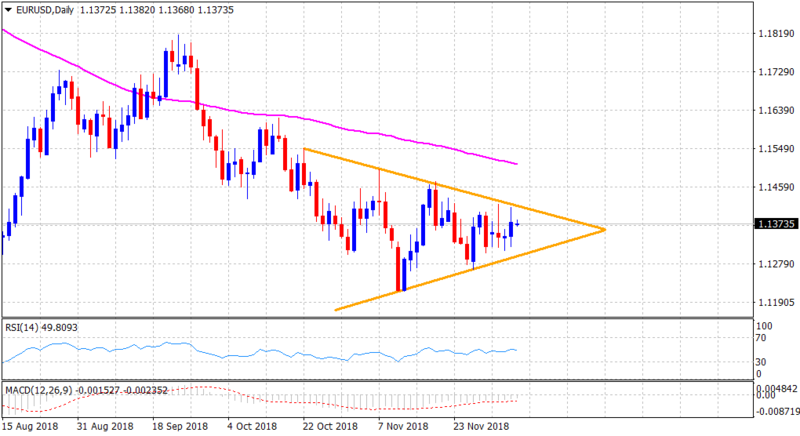 The mentioned trend-line, currently near the 1.1415-20 region, should continue to act as an immediate strong hurdle, which if cleared might trigger a short-covering bounce and assist the pair to aim towards reclaiming the key 1.1500 psychological mark. On the flip side, the 1.1320-10 region, nearing another ascending trend-line support near the 1.1300 region, remains an immediate strong support, which if broken decisively is likely to accelerate the fall back towards yearly lows, around the 1.1215 region. The downfall will further market a near-term bearish breakthrough a symmetrical triangle and should thus, pave the way for an extension of the pair's downward trajectory.